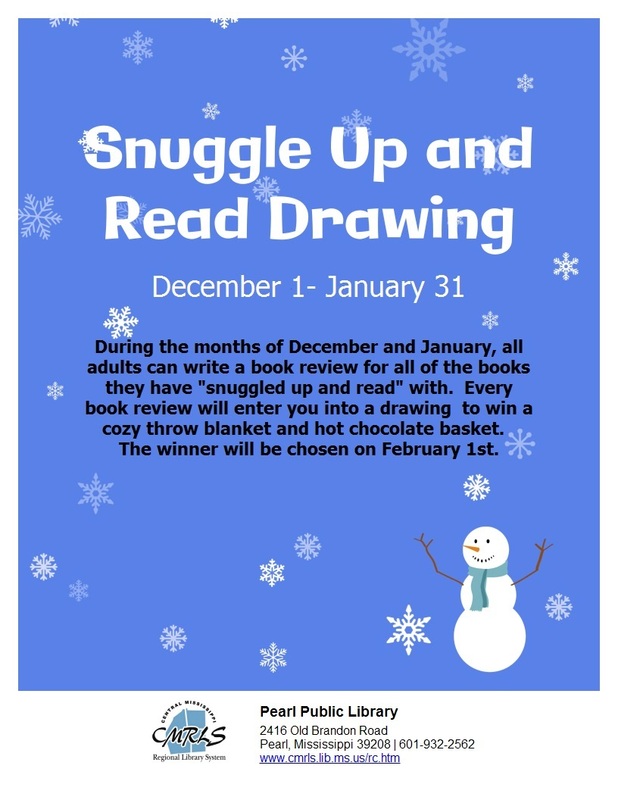 But there's plenty of warm and cozy going on at the Pearl Public Library? into a drawing for a cozy throw and hot chocolate basket to be held on Wednesday, Feb. 1. Now, that's pretty darn classy!!! Bet ya feelin' a little toasty already!!!! Well, there's more... 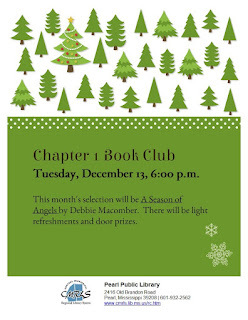 It's the season for all things magical and bright, and Patsy, the Chapter 1 Book Club leader, has just the right thing. 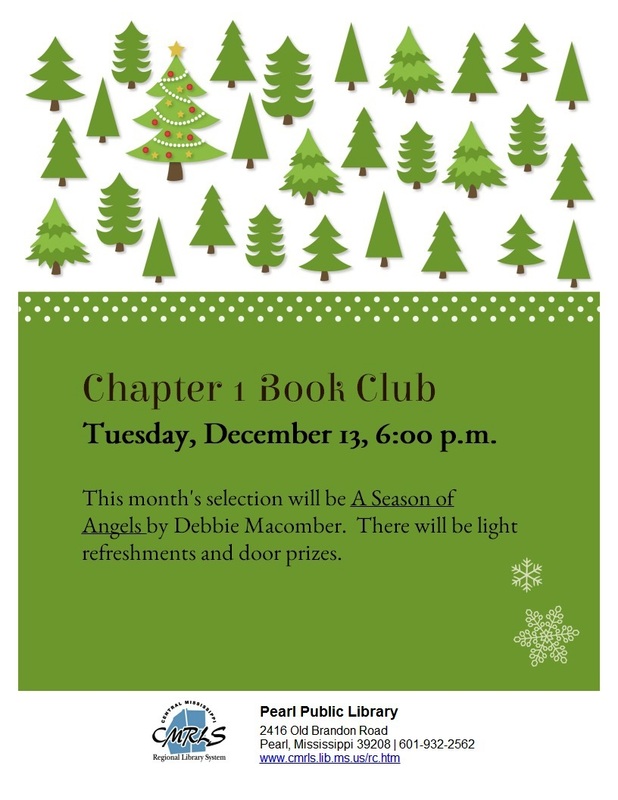 A Season of Angels by Debbie Macomber is the December selection. That's Tuesday, Dec. 13 at 6 p.m. There will be light refreshments and door prizes. You don't have to be a member and no registration required for this free adult program. What's the holidays without decorations?! No way! Bring on the decorations! And, that's what Amy has selected as her December Simply Crafts offering for Thursday December 15 at 6 p.m. ! No registration required and all materials are supplied! 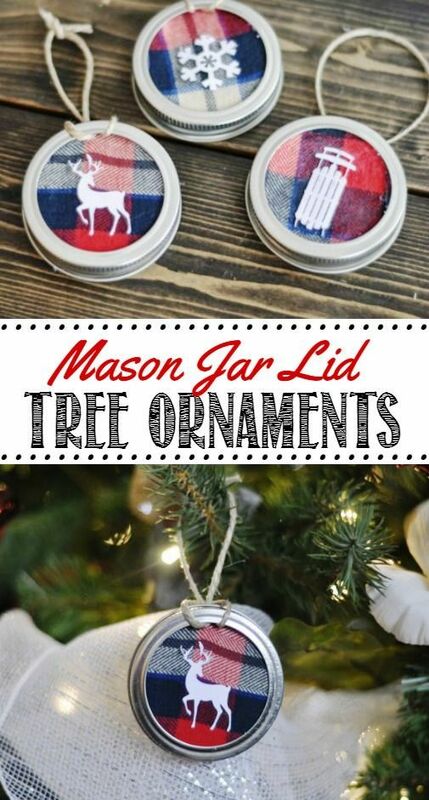 Beautiful Mason Jar Lid Tree Ornaments! 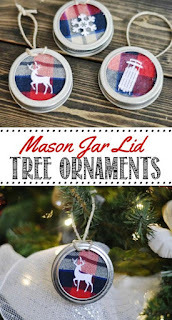 Simply made ornaments can't be beat! Nice Words Have A Way Of Paying Off! That's especially true at the Pearl Public Library. In an adult program called Thankful for the Library, fill out an entry form saying why you love the Pearl Library. Your entry goes right into a drawing for a $50 Wal-Mart gift card! Uh-HUH! A true holiday blessing! You have the entire month of November to enter! Many thanks to Wal-Mart of Pearl for donating the gift card. The drawing will be held Wed. Nov. 30! Hey!!!!! Btw, it may be June hot outside, but November haaaaaaaaas actually started! So, what are you waiting for?!??!?! Patrons of CMRLS Libraries can now access their favorite digital magazines using Flipster from EBSCO Information Services. Flipster is a next-generation magazine service that allows people to browse digital versions of the latest issues of popular magazines, courtesy of the library. There are more than 30 titles in the collection; including People, Entertainment Weekly, Time, Southern Living, Country Living, Real Simple, Good Housekeeping, Cooking Light, Family Tree, Flex, Car and Driver, Essence, Ebony, and many more. Personal subscriptions would cost hundreds of dollars, but now everyone in the 4-county area has access to these titles. View the magazines on any online device; or download to Android™ phones and tablets, Apple® phones and tables, and Kindle Fire tablets for offline reading anytime, anywhere. The Libraries also offer free Wifi. Flipster offers an easy, browse-able reading experience. Users can browse magazines by category as well as perform searches for specific periodicals. An online newsstand provides a carousel of the most recent issues, as well as a carousel of all issues allowing for quick access to magazines. The table of contents contains links for quick access to articles of interest and hotlinks within magazines are hyperlinked, opening in separate tabs when clicked. In addition, there is an option to zoom in and out for better readability. Contact your Library staff at any of the CMRLS Libraries; or visit online at cmrls.lib.ms.us to learn more about accessing the library’s digital magazines through Flipster. 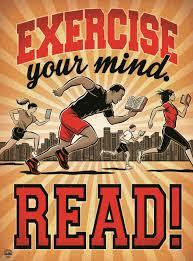 Flowood READS hits the ground running! But community help is still needed to make it a success. 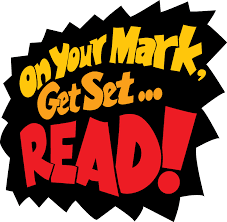 The Flowood Library's program, Flowood READS, has started. 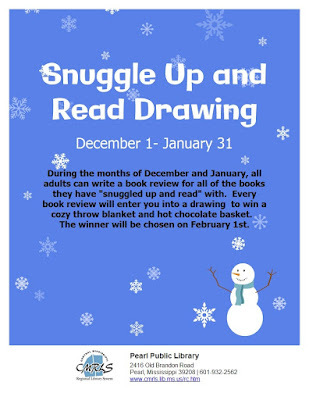 Consisting of 3 contests and four interactive programs, the library has developed a "City Wide Book Experience" that focuses on more than traditional literacy. "Flowood READS is a project that is modeled after the American Library Association's One Book, One Community program - it was designed to fold literacy into community engagement. I personally see it as a way to connect with those who aren't big readers; I see it as a way to showcase how the library is a community center rather than a repository for old books." Ashley Biggs, Branch Manager said. The library launched Flowood READS earlier this year with a host of Facebook contests - all of which had cash prizes awarded for the winners. Then on September 1st, the library launched the first of three in-person contests that encouraged artists to submit their own movie or book poster that would then be displayed for the public to vote on. The second contest, Peculiar Art, however, has already begun to gain speed. "We started out with 25 packs of "found" pieces that artists need to incorporate into their own artwork. That started on October 1st. By October 5th, we had given away 15 of the packs to those who wanted to submit their work for public vote." Biggs said. "We're really looking forward to displaying the creative pieces." Also this month, the library is hosting a Peculiar Photos program where attendees will be shown how to manipulate their own photographs to be similar to the odd photos found in both the book and movie. 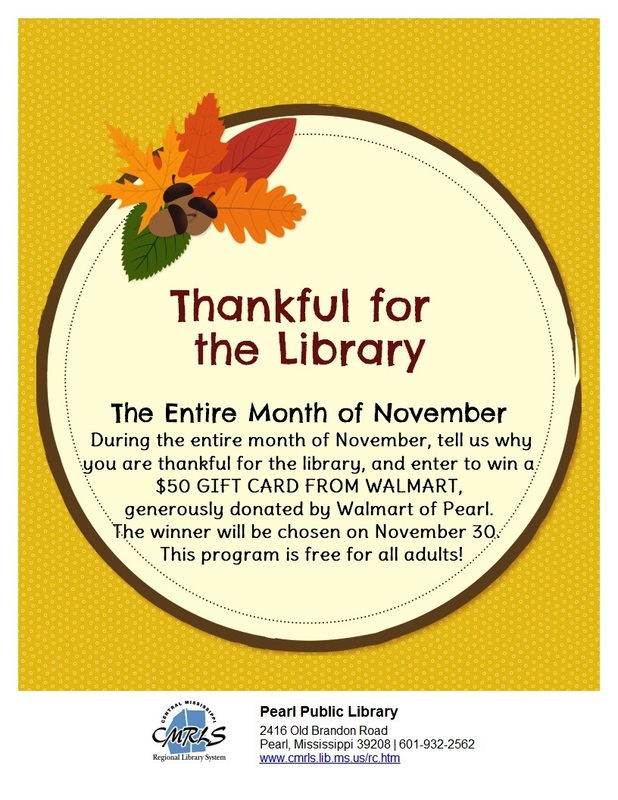 Those wanting to participate visit the library by October 26th, have their picture taken in front of the library's green screen, and then return to the library on October 29th to edit the photos using the library's mobile computer lab. "We've already had a lot of fun with this," Biggs said. "My staff and I have already started playing with the software and have come up with some weird photos! The way it will work is that we snap your picture using the library's camera and then on October 29th, you come back and we'll show you how to insert yourself into a 'peculiar' background, how to give yourself some form of a supernatural ability, and after it's all over, we'll upload them to Facebook for everyone to see." But that's not all. They have also planned a magic program around Mississippi's own Dorian LaChance, a short story contest and awards program, and finally a mini carnival, complete with a book talk. 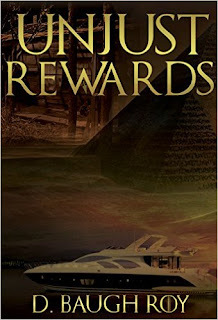 "The second book in the series takes place, at least in part, during a carnival. We thought having a carnival like program would be a great way to segue from one book to the other." Biggs said. "We had hoped to have the funds to really make the capstone event, the carnival, pop, but that hasn't happened. We're relying heavily on donations - both in kind and financial." To her great delight, a few local companies have stepped in to assist in making the program happen. "We've been blessed with help from Cups of Flowood, the Flowood Chamber, Dorian LaChance, the Flowood Compass, and the Friends of the Library." But there's still a lot more work to do, Biggs emphasized. "We're just a few short weeks away, and as excited as we are, and as important as this program is, we simply cannot make it happen without the support of the community." "We want this to become an annual program, much like summer reading. We have already started a vote for next year's theme," Biggs said. "It's between James Bond, Sherlock Holmes, and The Martian. So far, Sherlock is winning." The vote is on the Flowood READS Facebook page, and will be republished in November. All events that the library hosts are FREE and open to the public, and the programs associated with Flowood READS are no exception. For more information about the program, the library encourages you to visit the website: www.flowoodreads.com and their Facebook page, www.facebook.com/flowoodreads. If you are interested in helping with or volunteering at any of the library's events, you're encouraged to email the Branch Manager: fwbm@cmrls.lib.ms.us. All Day Affair! Get Your Free Screening! Don't worry about your deductible or any doctor's office visit costs! Not this time! The Pearl Public Library is hosting an all-day, free health fair, Friday, Oct. 21 from 9:30 p.m. to 4:30 p.m., featuring members of the Holmes Community College Nursing Program. Qualified nursing students will be accompanied by their instructor and registered nurse, Madeline Brewer. 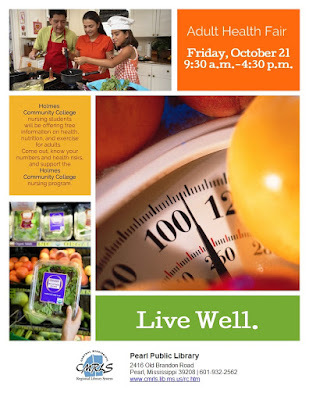 There will be free blood pressure screenings, free handouts, full of great health information and free answers to your questions! You simply cannot beat that! OK, so that's one healthy dose of October adult program, but it's not the only one. No way! Amy Lee, the adult program coordinator, has your October fully covered. That's right! Can't forget about Halloween now can we?!?!?!?!? So, is it trick or treat? HOW ABOUT BOTH?! You got it! Check this trick out. 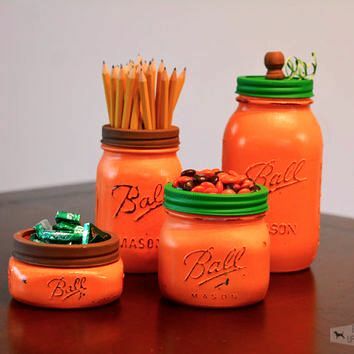 During Simply Crafts on Thursday, Oct. 20, at 6 p.m., participants will turn ordinary mason jars..... POOOOF!!!! into beautifully, decorative, nifty holding vessels. It's a free program, no reservations needed. All materials are supplied! Now how about the treat! Not missing a beat, Amy has a Halloween tea on tap! Wha Whaaaaaaaaaaattt! Halloween and a tea?!?!? What an OXYMORON, right?!? Maybe so, but this is gonna be one sweet tea you want to partake in! Yes, the time is right, from 2 p.m to 4 p.m. on Friday, Oct. 28 and there will be tea...bwwwhahahahwwwhahhh !!!! There will also be free cookies and donuts! So, get an early start! 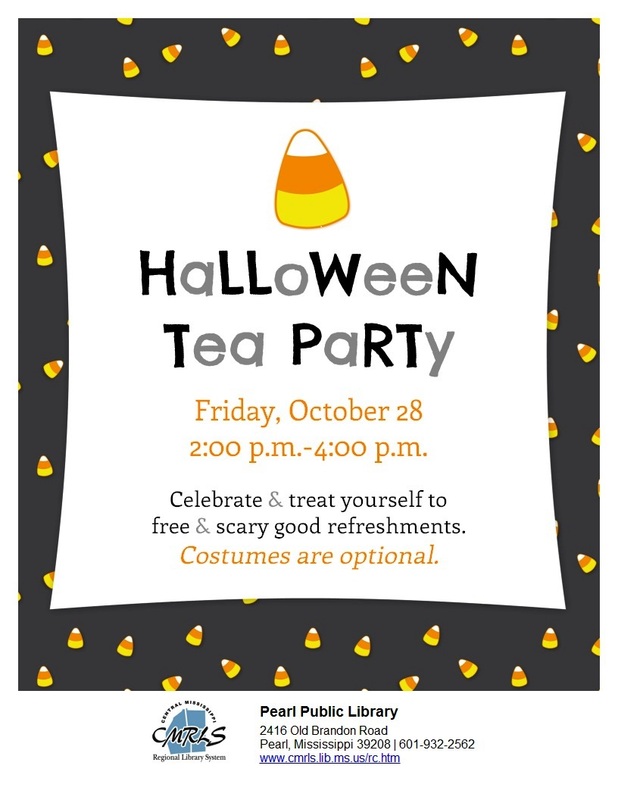 Come in costume if you'd like and treat yourself to Halloween yummies right here at the Pearl Public Library! Remember all adult programs are free. Don't miss out! These Boots Are Made For...TOURING!!! Zebert, now a resident of Chattanooga, TN, just published the third installment of her popular Callie and Dom series, Hand In Hand which came out on September 15. 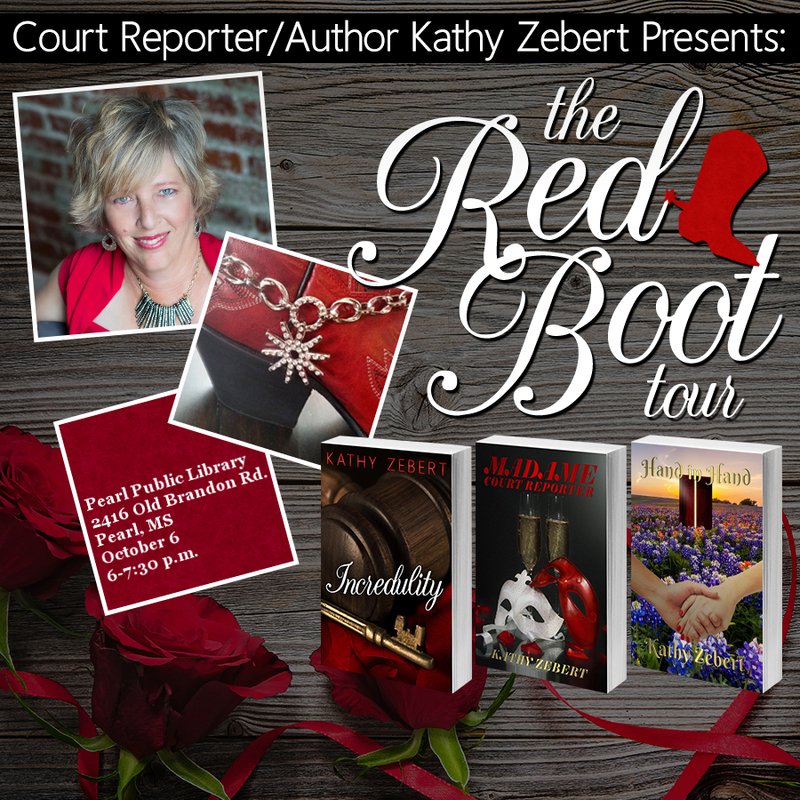 She’ll talk about all three books which include Incredulity (September 2015) and Madame Court Reporter (April 2016). Zebert, also a jewelry maker and baker, will be giving away, in a drawing, a piece of original boot jewelry. Complimentary specialty chocolates will be given to all attendees. 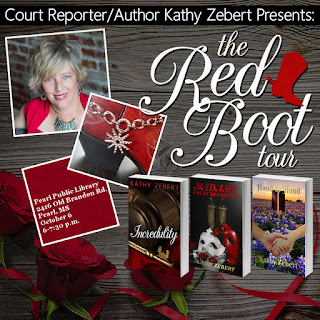 After the Pearl Library stop, Zebert will stop in Natchitoches, LA, Washington, DC, and Atlanta, GA for other business in conjunction with the Red Boot Tour. The program is free. No reservations required. All are welcome to attend. Light refreshments will be provided. Don't miss out on this wonderful evening!!! The library was eerily silent this week after school because the teens were in the meeting room playing Minecraft. We had fun building our shelters and gathering resources to survive the zombie apocalypse. If you enjoyed the peace and quiet, do not be dismayed by the farewell of the Minecraft kit. You will have another three weeks in November to enjoy a quiet library when Minecraft returns to Magee. The book club book this month is What Alice Forgot by Liane Moriarty. We will meet on Tuesday, October 11th at 12:30 p.m. to discuss our thoughts on the book. Do you have what it takes to decorate a pumpkin? The only rule we have is that you may not carve it. So, get out the paint, glitter, ribbon, glue, and shiny things. Let the creativity flow, and bring your pumpkin to Magee Public Library by October 21st. Maybe your pumpkin will win a prize! Fall Book Sale Weekend is sponsored by the Friends of the Brandon Library. The sale will be Friday, September 30, from 10-5, and Saturday, October 1, from 10-4. We will have Bag Day on Monday, October 3, from 10-8. For Monday only, books will be sold by the bag or by the box - $5 a bag or $10 a box. We support Red Friday during the regular football season. Every week there will be a drawing for a $10 coupon to a Brandon eatery. To enter, wear RED when you come to the library on Friday and check out one item. There is a new sign-up and prize every week. At the end of the season, we will put all the entries back in the big bowl and draw for the grand prize - an iPad Mini. There will also be additional prizes given away at that time - three Library Buck Awards of $10 each. Library Bucks can be used for fines or for Book Sale items. Library Bucks can not be used for debt collect charges. If you are interested in joining the Friends of the Brandon Library, their next monthly meeting is October 18 at 6 pm. Everyone is welcome. BIG BOOK SALE AND AN AMAZING INSPIRATIONAL STORY! The Pearl Public Library's September programming highlights include a huge, winning combination! It’s a bargain hunter’s dream and happens every year at the Pearl Public Library! 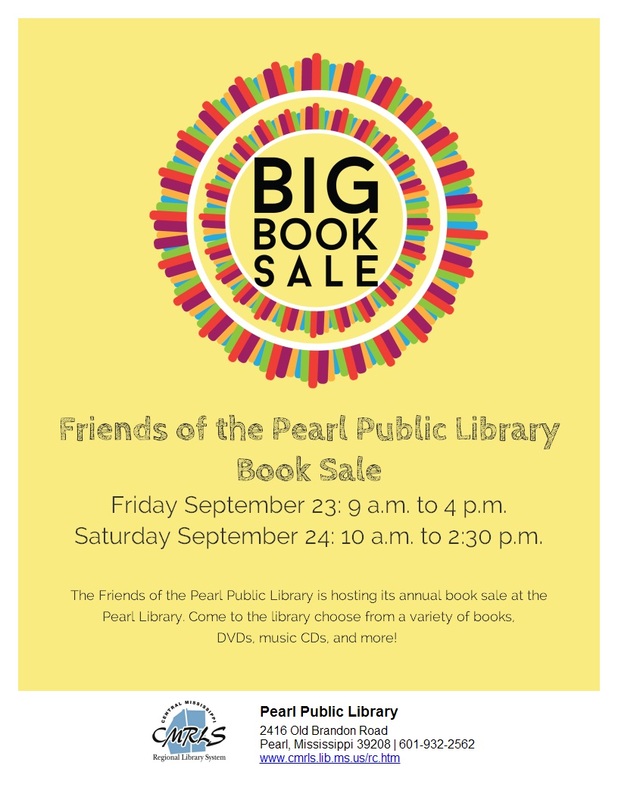 The Friends of the Pearl Library’s big, annual book sale is Friday, Sept. 23 from 9 a.m. to 4 p.m. and Saturday, Sept. 24 from 10 a.m. to 2:30 p.m. All proceeds benefit the Friends’ group, which support the library through volunteering, purchasing books and equipment and sponsoring programs for all ages. Among the many gems of this year’s book sale are Big Band Era and wartime music CDs, wartime DVDs and tons of cookbooks. Book sale prices range from .25 cents to $5.00. Near the end of the book sale on Saturday, all the leftover items will be on a special, bag-for-a-buck, bargain. It’s everything you can fit into a grocery bag for $1. 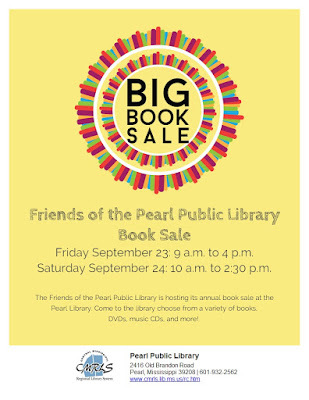 This year, to help advertise the book sale, a beautifully designed banner, by AlphaGraphics of Pearl, will be displayed in front of the library. 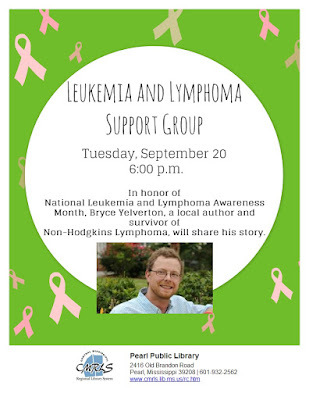 Bryce Yelverton, of Clinton, was diagnosed in December 2013 with Hodgkin Lymphoma Stage 2B, a blood cancer. 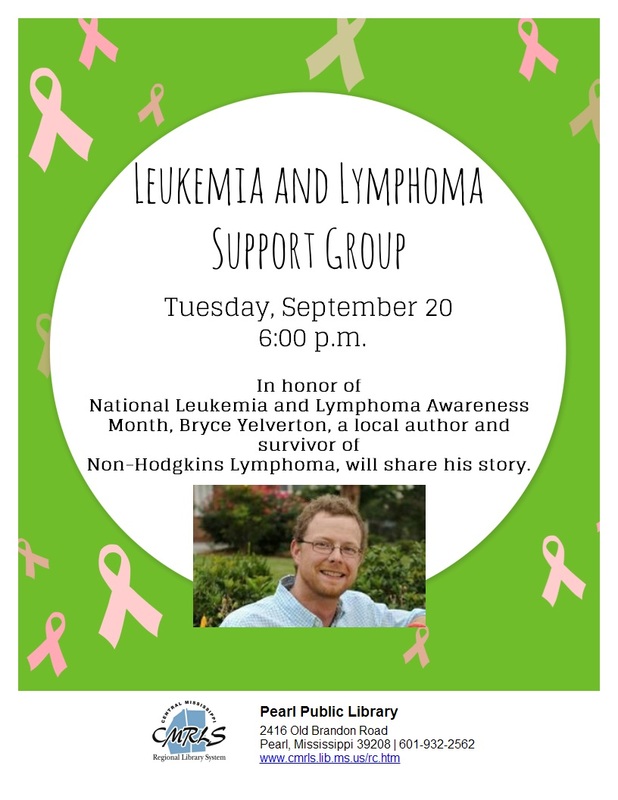 During a free, National Blood Cancer Awareness Month program at the Pearl Public Library, Tuesday, Sept. 20 at 6 p.m.,,Yelverton will share his story and talk about the Leukemia and Lymphoma Society. After a series of chemo and radiation treatments, Bryce was declared in remission in May 2014. Armed with Christian strength and the support of family and friends, Yelverton had the help he needed to fight the disease. He learned that the best way to combat cancer is not to let it be the overwhelming giant that silence and private suffering can make it. Cancer doesn’t have to mean the end. WOW! You don't want to miss either one of these events! As always, all programs are free to the public! Great Adult Programming Is Always In Season! 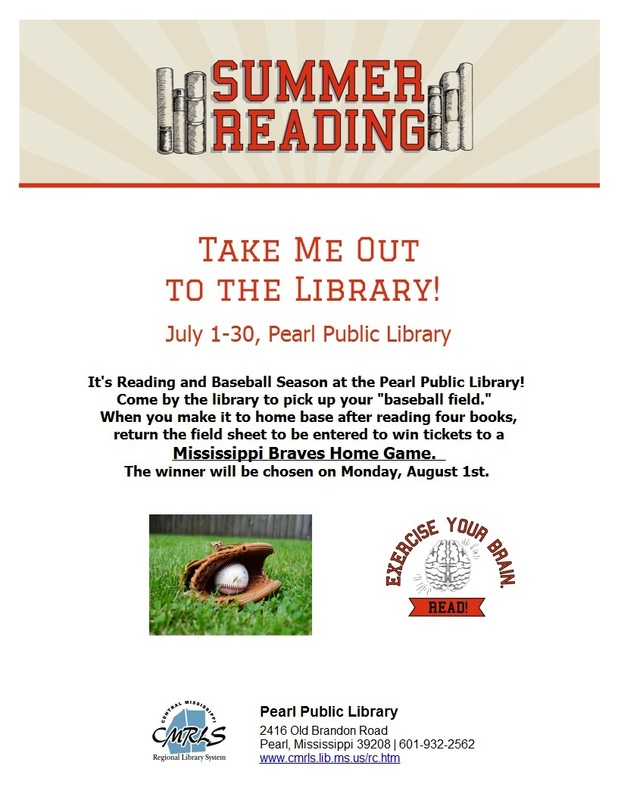 The Adult Summer Reading Program season may be over, but great programming is always on tap at the Pearl Public Library! Check out the August lineup!!! All month long, you can enter to win a prize by simply telling us who's your favorite inventor. 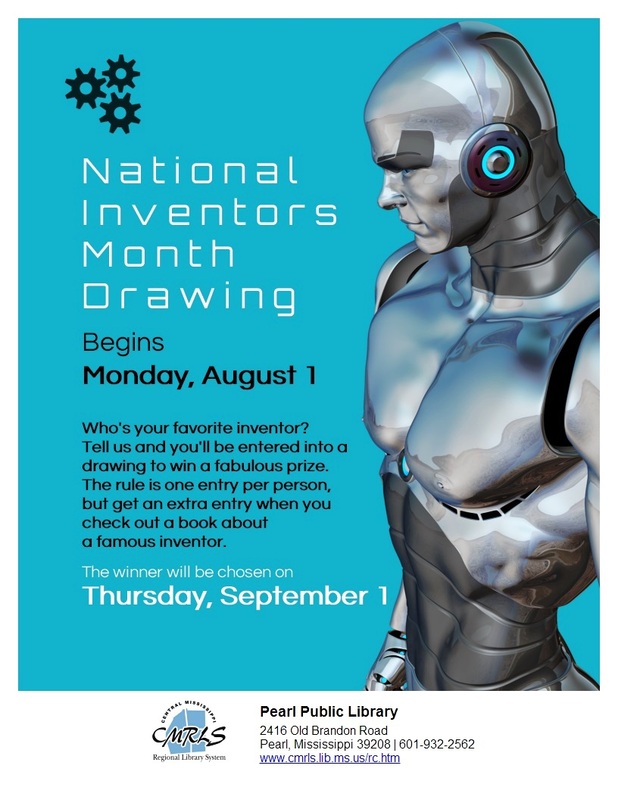 Double your chances by checking out a book about an inventor and get entered again! The drawing for a winner will be September 1. Mondays just got more instructional at the library! It's Computer Hour power! That's right. Need a little basic help with computers? Well, every Monday, from 1 p.m. - 2 p.m. the reference staff will offer basic computer instruction while you are either already using the public computers or come in specifically for basic instruction. It's free and no reservation is required. Need a little color in your life?! Then this adult program is for YOU!!! 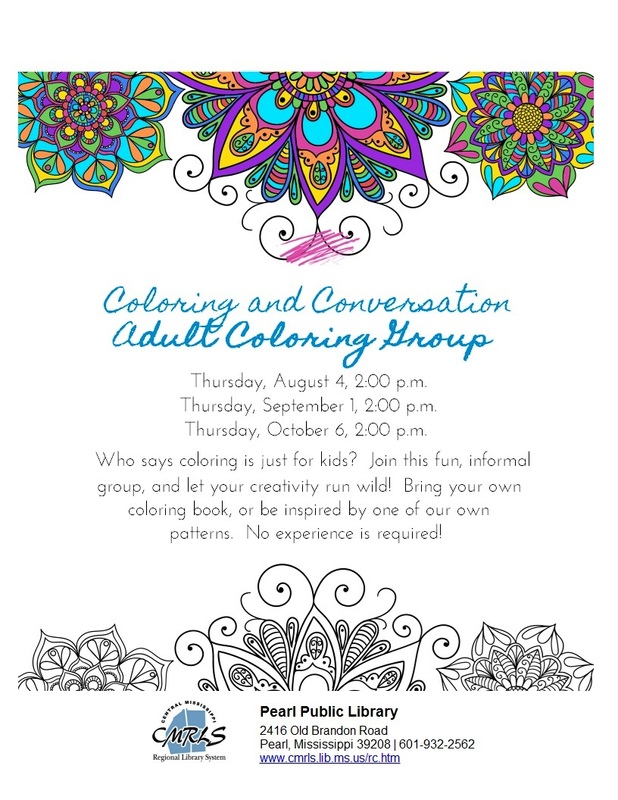 Coloring and Conversation, Thurs. Aug. 4 at 2 p.m. Bring your own coloring book or use one of our coloring sheets! There's also a door prize! Don't miss it!!! Ahhhh, who doesn't love a classic! 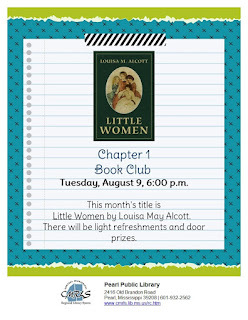 Little Women by Louisa May Alcott! That's the August Chapter 1 Book Club selection. Don't miss out on Tues. Aug. 9 at 6 p.m. No membership or reservation needed. There will be light refreshments and door prizes. Ever think about your thumbprint being creative? 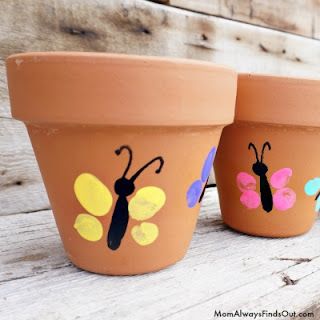 Well, just see how it can make pretty butterfly wings during Simply Crafts on Thurs. Aug. 18 at 6 p.m. Transform an ordinary flower pot into a work of art! Diabetes is a serious illness. It's so important to keep abreast of information that could help prevent or help you cope with diabetes! 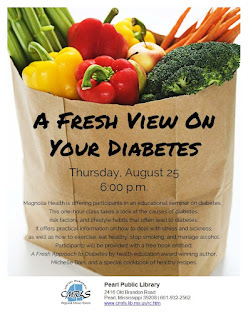 That's why this free, adult program, A 'Fresh' View on Your Diabetes, on Thurs. Aug. 25 at 6 p.m. is a must attend! Magnolia Health is offering a free class on the causes of diabetes and how to manage the disease. All attendees will be gifted a free book entitled: A Fresh Approach to Diabetes by health education, award winning author, Michelle Bain, and a cookbook of healthy recipes. So, you have to admit. 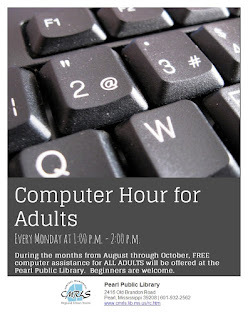 The Pearl Public Library's August adult programming is just awesome and worth visiting your local library! Come on in and enjoy all the free programs the library has to offer! There's More Than The Heat Sizzlin' At The Pearl Library! That's Right! Great adult programming continues all through the month of July at the Pearl Public Library! Take Me Out To The Library runs all month long. Come by the library and get your reading baseball field sheet that marks out bases. Read four books and make it to home base. Return the field sheet to be entered to win tickets to a Mississippi Braves home game. The winner will be chosen on Monday, Aug. 1. 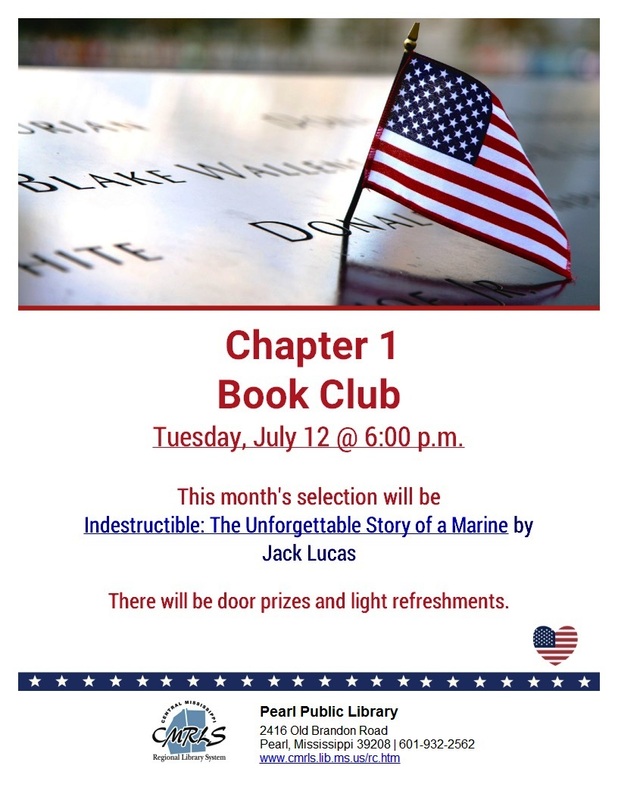 Chapter 1 Book Club gives a salute to its homeland with Indestructible: The Unforgettable Story of a Marine by Jack Lucas. That's on Tuesday, July 12 at 6 p.m. No reservation is required. There will be door prizes and light refreshments! Get transported to the beach with this month's Simply Crafts! 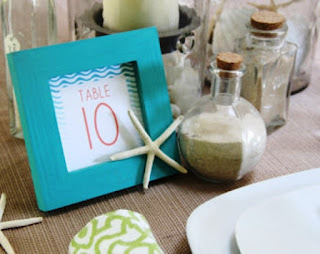 Painted Starfish and Seashell picture frames on Thursday, July 21 at 6 p.m. No reservation is needed and all materials are supplied. What's more relaxing than drawing?! 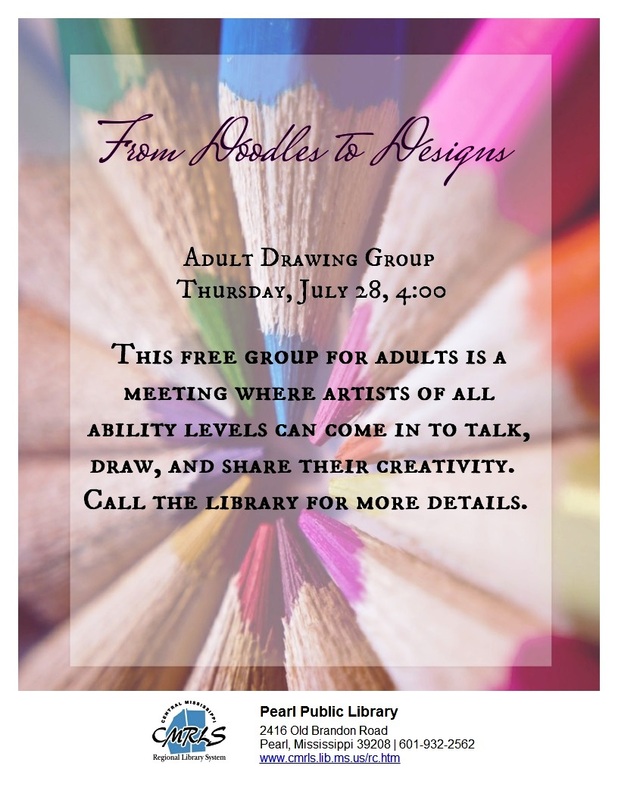 You'll get a chance to do just that in this special From Doodles to Designs drawing group program on Thursday, July 28 at 4 p.m. No reservation is needed! Don't miss out! All programs are free! LAKE: Crafts aren't just for kids! Young or old we all love to get our hands a little dirty and make something. This month in Lake the adults and some young adults got the chance to do some painting. A huge shout out to our talented teacher Vickie Hester. I haven't found anything she can't do. We try to do monthly crafts but this month was a huge success. We hope to keep the momentum going through the summer and on into the fall. We discussed other crafts we've wanted to try such as crocheting and even quilting. What are you interested in? If you have something that you have wanted to learn about but it hasn't been offered at your local library yet, don't be afraid to ask. You might be surprised at what they can come up with for you. Or you might find out it's being taught at a library right around the corner. And don't forget to check out our calendar of events where you can break down your search by branch, age category or perhaps a keyword that you looking for like knit or beading. You might be surprised at what new adventure is already out there waiting on you. The Month Of May Brings More Than Flowers At The Pearl Library! The month of May brings great adult programming to the Pearl Public Library! 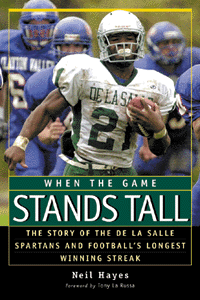 For starters, the Chapter 1 Book Club will feature Neil Hayes’ When the Game Stands Tall: The Story of the De La Salle Spartans and Football’s Longest Winning Streak on Tuesday, May 10 from 6-7 p.m.
“The Streak” it’s called. That’s the California high school’s phenomenal 151-game football winning streak from 1992 -2004. Interestingly enough, the school’s legendary coach, Bob Ladouceur was teaching these young men more about life than about how to set a national football game winning record. When the Game Stands Tall features Coach Lad, who was also a religious studies teacher as well as the football coach, and the inspiration he imparts to his players. What a great story! You don’t want to miss this Chapter 1 Book Club! It's a free adult program, and remember, you don't have to be a member to come join in the discussion. Light refreshments and door prizes provided. 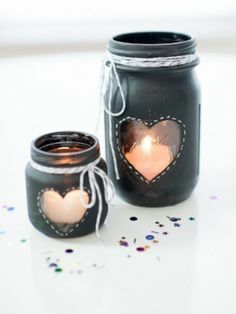 If making crafts is your type of fun, May’s Simply Crafts is decorative Mason jars with a peep hole! But, that’s not all! Part two of the this craft night on Thursday, May 19, from 6-7 p.m. is a homemade salt scrub using Epsom salt, olive oil and fragrant vanilla! Mmmmm, leaves your skin oh-so-soft, and it’s very relaxing! Couldn’t be easier to make. What better vessel to carry the salt scrub than the decorative Mason jar! See! Two crafts in one! Simply Crafts is free and all materials supplied! No reservations needed! ALERT! THIS PROGRAM HAS BEEN CANCELLED AS OF TODAY Monday, MAY 9, 2016. Ending the month on a high note, Mississippi attorney and author, Diane Baugh Roy (D. Baugh Roy) comes to the Pearl Library on Tuesday, May 31 at 4 p.m. to talk about her latest book. 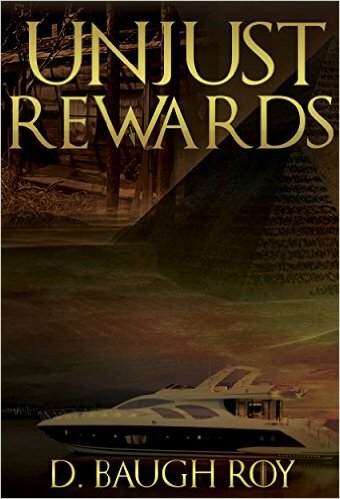 Unjust Rewards, the first in the Haley Browder Series, involves murder, the FBI and stolen millions in Hurricane Katrina recovery funds. You don't want to miss any of these programs! Spring is here! And, it’s time to celebrate! The Brandon Public Library will be hosting Celebrate Spring @ Your Library on April 23 from 10-4. Many free activities will be available for the family. Come see our Antique Car Show. Bring your camera and/or your antique car. Enjoy meeting other antique car owners. No entrance fee is required. Step back in time to the 19th century as you take a walking tour of the Rankin County Historical Society Museum. These historical buildings, a house and a general store, will be open for the day and will provide a snapshot of life in the era of pioneers. The Children’s Department will have activities for kids in the children’s area of the library. There will be activities celebrating Money Smart Week that starts April 23. We will also have Free Duplo Play and Free Lego Play during the day. Bring your IRS documents, your divorce decrees, and all your other sensitive documents to the library starting April 23. The Friends of the Brandon Public Library is introducing The Shredder to the community. The Shredder is a new shredding service that will be offered free of charge. If you want to take your shredded documents home with you, then trash bags are available at $1.00 a bag. Come join us for our Spring Book Sale. Used books and other items will be on sale Friday, April 22, from 10 to 5, and Saturday, April 23, from 10 to 4. Bag Day will be Tuesday April 26, from 10-8. On bag day, you can buy books for $5 a bag or $10 a box. The Friends of the Brandon Library sponsor the sale and proceeds will go to support your library. On Saturday, the Friends will have hot dogs, chips, popcorn, water, and sodas available for sale. All proceeds will benefit the Brandon Library. During the week of April 11-16, we celebrated National Library Week. First sponsored in 1958, National Library Week is a national observance sponsored by the American Library Association (ALA) and libraries across the country each April. It is a time to celebrate the contributions of our nation's libraries and librarians and to promote library use and support. The Brandon Public Library is a public research facility where you can check out books, DVDs, audio books, cake pans, and other items free of charge. Free eBooks and music are available through our website at www.cmrls.lib.ms.us. Let us help you get started today. We provide public access computers with free internet access. Free WiFi is also available at no cost to you. Fax and scanning services are available for $1 per page. For our college students, the Brandon Public Library proctors exams. Students, with prior arrangement with their professors, can take exams here at the library. There is no charge for this service. We listen to the needs of the community. The Brandon Public Library is now offering Notary Services. This service will be provided by the FOBL and will be available Monday thru Friday and even Saturday by appointment. There will be a minimal fee of $3. Check out our monthly Calendar of Events available at the Circulation Desk. When you are here April 23, sign up for our free eNewsletter that includes all the events here at the library. Don’t be left out of all the fun! We are committed to offering you a high quality of service for your information needs. Come in and let us help you! Brandon Public Library is part of Central Mississippi Regional Library System, which serves the public libraries of Rankin, Scott, Simpson, and Smith Counties. The library is located at 1475 West Government Street in Brandon. We are open Monday – Thursday 10-8, Friday 10-5, and Saturday 10-4. You can reach us at Brandon@cmrls.lib.ms.us or 601-825-2672. The Art and Community Studio Classes of Northwest Rankin High School held it's 2nd annual artist's reception at the G. Chastaine Flynt Memorial Library on April 11th. The theme, "Mississippi Landscapes," was inspired by Albert Smathers of Mississippi College and Mrs. Teresa Aikens of Northwest Rankin High School. They have worked together for the last 8 years. Smathers, a professional artist with over 30 years experience, visited the high school earlier this year to demonstrate his renowned techniques. His visit was so exhilarating for the students, Arts and Community Studio instructor Teresa Aikens, encouraged the students to take photographs of their favorite Mississippi locals and turn them into stunning works of art. "This exhibit is part of the focus of the Art and Community Studio Classes," Aikens said. "The students work hard to make their art a visible part of the community." She added that in addition to the annual library exhibit of student paintings, the class also partners with community businesses and organizations to create artwork for permanent installations. "This year, so many of our patrons engaged with the paintings, choosing their favorite and casting a vote," Ashley Biggs, Branch Manager of the G. Chastaine Flynt Memorial Library said. "The students, parents, school faculty, and library patrons had a wonderful time mingling at the reception and awards ceremony. It will be exciting to see those patrons who voted come back to see which pieces were be selected." As part of the exhibit, which was installed on March 1st, library patrons were encouraged to vote for their favorite pieces. Nearly 100 votes were cast. Paintings will hang until April 30th. The library looks forward to hosting more paintings in the coming years! CMRLS Libraries keep you connected! Free WiFi at all 20 Libraries and free public access computers to use! There's eBooks and eAudioBooks, free music to download, and a new website! Check out the Digital Library It's all there! Your Library 24/7! WOW, a Library at your fingertips with your CMRLS Library Card. How do I get a CMRLS Library Card? It's free to anyone who lives, works, or attends school in the 4-County area. After you use your card, we will email or text you to remind you that you have items that will soon be due. The email or text will come 3 days before the due date and will list the items you have checked out. It is just a friendly reminder that you have items that will soon be overdue. There is even a link to use to renew (by phone or online) your items if you need them longer! For your convenience have all family Early Notices sent to one phone or address. We try to save you from overdue fines! There are free library programs throughout Rankin, Scott, Simpson, and Smith County libraries; beginning with preschool story times; adult and young adult book clubs, computer or craft classes, and movie matinees. Something for everyone! The Event Calendar is searchable by library branch, age category, or keyword. You may even choose to be reminded by email of a future program. We can't say enough about libraries and what you can do with a Library Card! Of course you can still check out books, you just have so many options. Now you have the option of reading the newest bestseller in normal or large print, eBook, downloadable audiobook, audiobook on CD; or because of a visual or physical limitation, books may be requested on digital cartridge, cassette, or Braille from Mississippi's Talking Book Services. Do you have a question about programs or services? 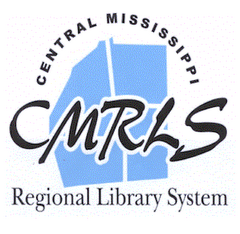 You may use the linked Customer Service form or the email address custsvc@cmrls.lib.ms.us to contact us. Do you need homework or research help? Use the Ask a Librarian form or use the email address ask@cmrls.lib.ms.us; or call or email the Library nearest you. Have a great National Library Week! This is a time to celebrate the contributions of our nation's libraries and library workers and to promote library use and support. From free access to books and online resources for families to library business centers that help support entrepreneurship and retraining, libraries offer opportunity to all. The theme for 2016 National Library Week is "Libraries Transform." First sponsored in 1958, National Library Week is a national observance sponsored by the American Library Association (ALA) and libraries across the country each April. It is a time to celebrate the contributions of our nation's libraries and librarians and to promote library use and support. All types of libraries - school, public, academic and special - participate. Check the online calendar to see what is offered at your Library this special week! Chapter 1 Book Club Enters Lively "Kingdom" at Pearl! Patsy has picked a really great book for her next Chapter 1 Book Club meeting on Tuesday, April 12 at 6 p.m. at the Pearl Public Library. 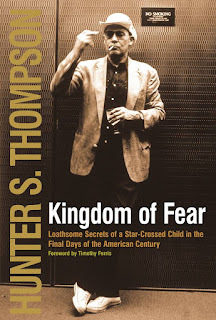 Kingdom of Fear: Loathsome Secrets of a Star-Crossed Child in the Final Days of the American Century is by journalist Hunter S. Thompson. 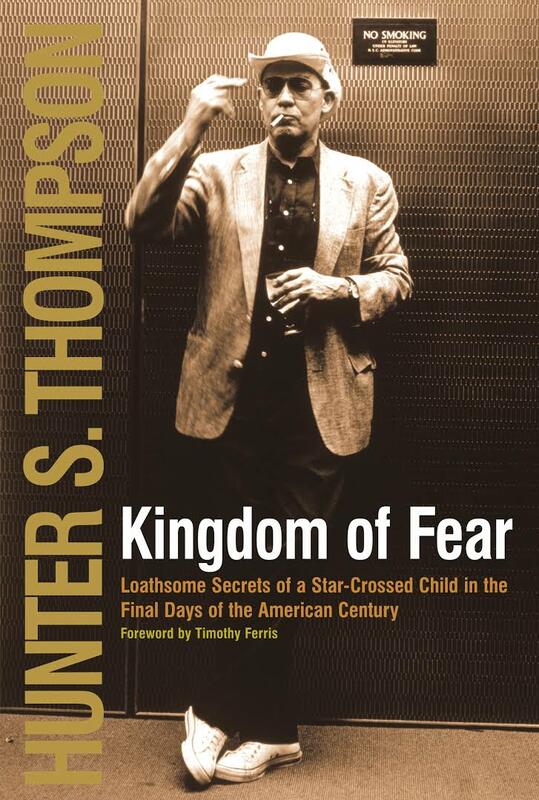 It's a lively recounting of Thompson's hard-driven life as a rebel who marched to the beat of his own drum. Thompson is credited with creating "Gonzo journalism" a personalized style of reporting that puts the writer at the center of the story. Thompson was born in Louisville, KY on July 18, 1937. His life included a frequent use of drugs and a passion for firearms. Suffering from health problems, and depression Thompson committed suicide in 2005. He was 67. 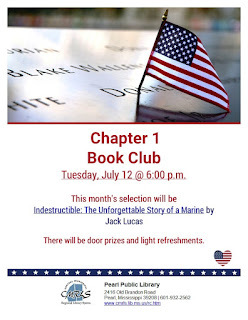 Don't miss this Chapter 1 Book Club! You can see it's going to be a really good one as always! It's a free adult program, and remember, you don't have to be a member to come join in the discussion. Light refreshments and door prizes provided.